If you have created an antispam policy and applied it only on some domains and you do not understand why it is not working on some mailboxes, you must verify that the principal SMTP of those mailboxes is part of the domains set in the antispam policy. Indeed, only the principal SMTP address of the mailboxes is checked in order to know if the antispam policy has to be applied or not. Update 08/04/2015 : MS told me that effectively this parameter is not working and they are going to make a fix. Recently for my company I had to perform some reports regarding spam and malware identified by EOP. 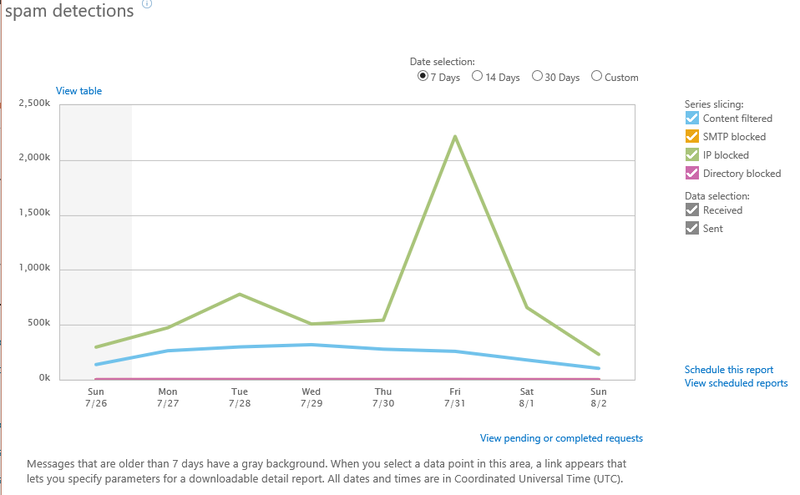 You will told me “Easy you can get them weekly or monthy by the O365 admin portal” (tab “reports”). Two commands to know, Get-MailDetailSpamReport and Get-MailDetailMalwareReport which will give you all the spam or malware identified in a timeframe.You can also give a domain to get only the spam or malware identified for a given domain. I’m currently in touch with MS to know why it isn’t working ! They gave me a tool that looks extremely useful for malware and spam report which is “Mail Protection Reports for Office 365 “, you just have to give your admin credentials and the timeframe you want and the excel file will be filled with graphics and details ! I will keep you update on what I will found to perform this.